Microbial molecules or cytokines can stimulate dendritic cell (DC) maturation, which involves DC migration to lymph nodes and enhanced presentation of Ag to launch T cell responses. Microbial TLR agonists are the most studied inducers of DC maturation, but type I IFN (IFN-I) also promotes DC maturation. In response to TLR stimulation, DC maturation involves a burst of Ag processing with enhanced expression of peptide–class II MHC complexes and costimulator molecules. Subsequently, class II MHC (MHC-II) synthesis and expression in intracellular vacuolar compartments is inhibited, decreasing Ag processing function. This limits presentation to a cohort of Ags kinetically associated with the maturation stimulus and excludes presentation of Ags subsequently experienced by the DC. In contrast, our studies show that IFN-I enhances DC expression of MHC-II and costimulatory molecules without a concomitant inhibition of subsequent MHC-II synthesis and Ag processing. Expression of mRNA for MHC-II and the transcription factor CIITA is inhibited in DCs treated with TLR agonists but maintained in cells treated with IFN-I. After stimulation with IFN-I, MHC-II expression is increased on the plasma membrane but is also maintained in intracellular vacuolar compartments, consistent with sustained Ag processing function. These findings suggest that IFN-I drives a distinctive DC maturation program that enhances Ag presentation to T cells without a shutdown of Ag processing, allowing continued sampling of Ags for presentation. The functions of dendritic cells (DCs) at the nexus of innate and adaptive immunity (1–5) are regulated by their maturation in response to pathogen-associated molecular patterns (PAMPs); for example, agonists of TLRs (4, 6–11). When activated by TLR agonists at a site of infection, DCs mature, upregulate expression of lymph node homing molecules, and stimulate Ag-specific T cell responses. TLR-induced DC maturation is characterized functionally by increased potency of DCs as APCs, resulting from increased expression of peptide–class II MHC complexes (3, 4, 12) and costimulator molecules (e.g., CD80, CD86) (13, 14). The induction of maturation produces a brief upregulation of Ag endocytosis and processing (15, 16) and a prolongation of the half-life of peptide–class II MHC complexes (3, 6) due to decreased ubiquitination, endocytosis, and degradation (17–24). Decreased class II MHC (MHC-II) ubiquitination is caused by decreased expression of MARCH1, an E3 ubiquitin ligase expressed primarily in professional APCs (20–25). This results in prolonged expression of a cohort of pathogen-associated peptide–MHC-II complexes, driving activation of pathogen-specific T cells in lymph nodes. After the initial TLR-induced burst of Ag processing, however, Ag endocytosis decreases (26), intracellular localization of MHC-II molecules in Ag processing compartments decreases (27, 28), and the synthesis of MHC-II molecules and formation of peptide–MHC-II complexes drop dramatically (29, 30). Decreased synthesis of MHC-II is due to decreased expression of CIITA, which regulates MHC-II gene transcription (6, 29, 31). This mechanism focuses DC Ag presentation on a cohort of peptide–MHC-II complexes formed at the time of exposure to PAMPs, resulting in presentation of peptides that are enriched in pathogen-derived Ag, and it prevents processing and presentation of Ags later encountered by DCs. Although the TLR pathways, often involving MyD88, are its most studied inducers, DC maturation is also driven by type I IFN (IFN-I), for example, IFN-α subtypes or IFN-β, which signal through a single IFN-I receptor. IFN-I can induce maturation of DCs characterized by upregulation of MHC-II and CD86 (32–39) and drive migration of Langerhans cells (33). IFN-I and TLR/MyD88 signaling are two semiredundant pathways that drive DC maturation (40, 41). IFN-I is required for the enhancement of T cell responses by TLR agonists such as polyinosinic:polycytidylic acid [poly(I:C)] that do not signal through MyD88 (42, 43). Regulation of DCs by IFN-I contributes to induction of class I MHC cross-processing and CD8+ responses as well as the induction of CD4+ responses (44–48). Although IFN-I is important for regulation of DCs and T cell responses, its regulation of DC MHC-II Ag processing and presentation has not been studied in-depth; important differences between DC maturation induced by IFN-I versus that by TLR agonists are not understood. In contrast to TLR-induced DC maturation, our studies show that IFN-I enhances DC expression of MHC-II and costimulatory molecules without inducing subsequent inhibition of MHC-II synthesis and Ag processing. Thus, DCs that undergo maturation in response to IFN-I may be less kinetically restricted in the acquisition and processing of Ag for presentation to T cells. This may result in increased opportunity to present Ags that are encountered at different times and locations. C57BL/6J and C57BL/10ScnJ mice were from The Jackson Laboratory (Bar Harbor, ME). MyD88−/− mice were from Shizuo Akira. All mice were housed under specific pathogen-free conditions. CpG-A oligodeoxynucleotide (ODN) 2336 (5′-ggG GAC GAC GTC GTG ggg ggG-3′) (lowercase letters indicate nucleotides for which the 3′ internucleotide linkage was phosphorothioate-modified; uppercase letters indicate standard phosphodiester-linked nucleotides) was from Sigma-Aldrich (St. Louis, MO). Synthetic triacylated lipopeptide N-palmitoyl-S-[2,3-bis(palmitoyloxy)-(2RS)-propyl]-[R]-cysteinyl-[S]-seryl-[S]-lysyl-[S]-lysyl-[S]-lysyl-[S]-lysine (Pam3CSK4) and ultrapure LPS from Escherichia coli 0111:B4 were from Invivogen (San Diego, CA). Recombinant human IFN-β was from Peprotech (Rocky Hill, NJ). Recombinant human IFN-α2a and murine IFN-α4 and IFN-β were from PBL IFNSource (Piscataway, NJ). Incubations were carried out at 37°C with 5% CO2. DCs were grown in complete RPMI 1640 medium consisting of RPMI with l-glutamine and glucose, supplemented with 10% heat-inactivated FCS, 50 μM 2-mercaptoethanol, 1 mM sodium pyruvate, and 1% penicillin/streptomycin (all from Hyclone, Logan, UT). Ag processing assays were done in complete DMEM medium consisting of DMEM with l-glutamine and glucose (Hyclone), supplemented with 10% heat-inactivated FCS, 50 μM 2-mercaptoethanol, 1 mM sodium pyruvate, 10 mM HEPES (Hyclone), and 1% penicillin/streptomycin. To make murine DCs, bone marrow cells were isolated from mouse femurs and tibias. RBCs were lysed with ACK lysis buffer (Lonza, Walkersville, MD). To make DCs derived from Flt3 ligand (Flt3L)-stimulated murine bone marrow (“Flt3L DCs”), marrow cells were cultured with Flt3L–Ig fusion protein (1 μg/ml) (Bioexpress, West Lebanon, NH) to produce a DC culture containing myeloid dendritic cells (mDCs) and plasmacytoid dendritic cells (pDCs). On day 8, nonadherent cells were collected. Alternatively, marrow cells were cultured with J558L cell-conditioned medium (containing GM-CSF) diluted in complete RPMI medium to produce “GM-CSF DCs,” which are mDCs (49). On day 7, nonadherent cells were collected. Studies with cells from human donors were approved by the University Hospitals Case Medical Center Institutional Review Board. Blood was harvested in heparinized syringes. PBMCs were collected as reported (50). Human mDCs were purified by positive selection for CD1c (BDCA-1) with a kit (Miltenyi, Auburn, CA) as reported (51). DCs were cultured in IMDM (Lonza) supplemented with 5% pooled human serum (Gemini Bioproducts, West Sacramento, CA) and GM-CSF (200 U/ml; Berlex, Montville, NJ). The CD4OVA.1 and CD4OVA.2 T hybridoma cell lines were generated in these studies by incubating splenocytes from OT-II TCR transgenic mice in vitro with OVA(323–339) peptide (100 nM) for 4 d and immortalizing proliferating T cells by fusion with BW1100 cells. CD4OVA.1 and CD4OVA.2 T hybridoma cells were used to detect OVA(323–339)–I-Ab complexes in Ag processing assays with murine DCs. F9A6 T hybridoma cells (52) were used to detect Ag85B(97–112)–HLA-DR1 complexes presented by human DCs. After 7 d in culture, murine DCs were sorted with CD11c microbeads (Miltenyi MACS) and incubated with agonists for 24 h. DCs were washed twice in PBS with 0.1% BSA, incubated on ice for 15 min in Fc block, incubated 30 min with unconjugated anti–I-Ab or isotype control (BD Biosciences), washed four times in ice-cold PBS with 0.1% BSA, and resuspended in complete medium. Duplicate samples were cultured at 37°C for 0, 45, or 90 min, chilled on ice, and stained with Alexa Fluor 488 rabbit anti-mouse Ab (Invitrogen). Samples were washed, fixed, and analyzed by flow cytometry as described earlier. Specific MFI was normalized to the level at time 0. Murine DCs (5 × 104 to 10 × 104/well) were incubated for 20–24 h in complete DMEM medium with IFN-β, Pam3CSK4, LPS, or CpG-A ODN with or without OVA. Cells were washed and fixed with 1% paraformaldehyde or washed and incubated 4 h with OVA prior to fixation. DCs were washed, and CD4OVA T hybridoma cells (105/well) were added and incubated for 24 h. Alternatively, human mDCs (104 per well) were incubated for 16–18 h with Pam3CSK4 or IFN-α in the continued presence of GM-CSF (200 U/ml), washed, and incubated with Mycobacterium tuberculosis Ag85B [purified as described (53)] and F9A6 T hybridoma cells (50) (105/well) for 24 h. Supernatants (100 μl) were harvested, frozen, thawed, and used in a CTLL-2 bioassay for IL-2 (54). Alamar blue (15 μl; Invitrogen, Carlsbad, CA) was added for the last 24 h. Alamar blue reduction was analyzed by reading the difference between OD at 570 nm and OD at 595 nm on a Bio-Rad Model 680 plate reader. DCs (3 × 106 to 5 × 106/well) were incubated for 18–24 h with medium, IFN-α, IFN-β, Pam3CSK4, LPS, or CpG-A ODN. RNA was purified using the Qiashredder kit and RNEasy Plus kit (Qiagen). RNA yield was quantified by OD, and 1 μg of each sample was used to synthesize cDNA using the Quantitect Reverse Transcription Kit (Qiagen); 4% of the total cDNA from each reaction was used in a quantitative PCR with 500 nM of 5′ and 3′ primer for each gene and SYBR Green detection (Bio-Rad, Hercules, CA) using the Bio-Rad CFX96 Real Time fluorescence detection system. All conditions were tested in triplicate. Primer sequences are as follows. GAPDH: sense 5′-AACGACCCCTTCATTGAC-3′, antisense 5′-TCCACGACATACTCAGCAC-3′. Total CIITA mRNA: sense 5′-ACGCTTTCTGGCTGGATTAGT-3′, antisense 5′-TCAACGCCAGTCTGACGAAGG-3′. The β-chain of MHC-II I-Ab (I-Aβb): sense 5′-AAGATGTTGAGCGGCATCGG-3′, antisense 5′-GTCAGGAATTCGGAGCAGAG-3′. MARCH1: sense 5′-ATGCACGGACAAAGCAATGG-3′, antisense 5′-GTGTGAAGTCACGGGCAATC-3′. Primers were previously described (31, 55) or designed using Clone Manager Suite v7.11 and Primers Designers v5.11 (Scientific & Educational Software, Cary, NC). A BLAST search was performed to verify specificity. DCs were incubated with medium, IFN-β, LPS, or Pam3CSK4 for 20 h at 37°C. Subsequent steps for purification of nuclei were performed at 4°C. Cells were washed in PBS with protease inhibitors [protease inhibitor mixture (P8340; Sigma-Aldrich) plus 1 mM NaF, 1 mM PMSF, and 10 nM calyculin A], pelleted, and incubated in 1 ml Nuclei EZ Prep Lysis Buffer (Sigma-Aldrich) with protease inhibitors for 10 min. After centrifugation at 500 × g for 5 min, supernatants were removed, and pellets were resuspended in 1 ml Nuclei EZ Prep Lysis Buffer with protease inhibitors for 10 min to remove residual cytosolic material. Nuclei were collected by centrifugation at 500 × g for 5 min, solubilized in 10% glycerol, 2% SDS, 63 mM Tris-Cl, then sonicated and boiled. Protein concentrations were determined using the BCA assay (Thermo Scientific, Rockford, IL) to standardize loading for analysis by 12% SDS-PAGE and Western blotting. DCs (106 per sample) were incubated for 24 h with medium, IFN-β, LPS, or Pam3CSK4, washed once with PBS, and then lysed in 1% Triton X-100 with 150 mM NaCl, 25 mM Tris-Cl, pH 7.4, 25 mM NEM, and protease inhibitor mixture. Samples were centrifuged for 15 min at 14,000 × g. Supernatants were precleared for 1 h with 50 μl rec-Protein G Sepharose 4B (Invitrogen). Immunoprecipitations were performed for 90 min at 4°C using Protein G Sepharose and 4 μg control Ab (mouse IgG) or Y3P, specific for I-Ab (56). The beads were washed three times with ice-cold 0.1% Triton X-100 in 150 mM NaCl, 25 mM Tris-Cl, pH 7.4, and then resuspended in nonreducing sample buffer for analysis by 10% SDS-PAGE and Western blotting. Samples were analyzed by SDS-PAGE and transferred to Immobilon membranes (Millipore, Billerica, MA). Membranes were blocked using PBS-T with 5% dry milk with the exception of anti-ubiquitin blots, which were performed using 3% BSA in PBS-T. Primary Abs were specific for actin (clone I-19; Santa Cruz Biotechnology, Santa Cruz, CA), C/EBP-β (clone C-19; Santa Cruz Biotechnology), ubiquitin (biotinylated-P4D1; Covance, Princeton, NJ), or I-Aβb (KL295; American Type Culture Collection). Detection was performed using HRP-conjugated neutravidin (Invitrogen) or HRP-conjugated secondary Abs (eBioscience) followed by ECL Western blotting substrate (Thermo Scientific). DCs (3 × 106 to 5 × 106/well) were incubated for 24 h with medium, IFN-α, IFN-β, Pam3CSK4, LPS, or CpG-A ODN. Cells were fixed and permeabilized using a Fix and Perm kit (Invitrogen). After permeabilization, cells were stained with biotinylated anti–I-A/I-E (eBioscience) for 30–60 min, washed with PBS, 0.1% BSA, and incubated with streptavidin–Alexa Fluor 488 (Invitrogen) for 30 min. Cells were washed with PBS, 0.1% BSA, and mixed with Prolong Gold mounting medium with DAPI (Invitrogen). The resulting cell suspension was placed on glass slides and covered with a poly-lysine–coated coverslip (BD Biosciences). Images were captured using a Leica TCS-SP microscope. Visual counts were performed to determine the number of cells with cell-surface MHC-II expression, and at least 100 cells were counted per condition. DCs (3 × 106 to 5 × 106/well) were incubated for 24 h with medium, IFN-α, IFN-β, Pam3CSK4, LPS, or CpG-A ODN. Cells were surface-stained for 30 min on ice with a combination of PE–cyanin7–anti-CD11b and PE–cyanin7–anti-CD11c (eBioscience). Cells were washed, fixed, permeabilized as for confocal microscopy, and stained for 30 min with PE–cyanin5–anti–I-A/I-E (eBioscience) and a combination of Alexa Fluor 488–anti-LAMP1 and Alexa Fluor 488–anti-LAMP2 (eBioscience). DAPI (10 μg/ml) was added, and cells were analyzed by imaging flow cytometry on an Imagestream cytometer (Amnis, Seattle, WA). Data were analyzed using the IDEA software (Amnis). Although TLR agonists and IFN-I stimulate distinct signaling pathways, these agents share the capacity to induce DC maturation. However, it is unclear whether mature DCs induced by these different agents differ in phenotype and function. Moreover, the Ag processing and presentation functions of DCs induced by these different agents have not been studied in-depth. We confirmed that TLR agonists and IFN-β increased expression of CD80, CD86, and MHC-II on murine Flt3L DCs, although IFN-β produced a weaker induction of CD80 and CD86 (Fig. 1A–C). We also determined that IFN-β, Pam3CSK4, and LPS all enhanced the ability of DCs to present OVA(323–339) peptide to MHC-II–restricted T hybridoma cells (Fig. 1D). When DCs were exposed to OVA protein with simultaneous stimulation by Pam3CSK4 or IFN-β, we observed an increase in OVA processing and presentation to MHC-II–restricted T cells (Fig. 1E). C57BL/10J Scn mice that are deficient in TLR4 signaling were used to avoid maturation of DCs by possible LPS contamination of the OVA Ag preparations (Fig. 1E); similar results were seen with C57BL/6J DCs, but with a higher level of background DC maturation (data not shown). Although the DC maturation phenotypes induced by TLR agonists and IFN-β may differ to some degree, they share the common features of increased expression of MHC-II and costimulator molecules as well as increased MHC-II Ag presentation. TLR agonists and IFN-β induce maturation of DCs. Flt3L-derived DCs (2 × 105/well) were cultured for 48 h with medium, IFN-β (100 U/ml), Pam3CSK4 (10 nM), or LPS (50 ng/ml). DCs were stained with anti-CD11b, anti-CD11c, and (A) anti-CD80, (B) anti-CD86, (C) anti–MHC-II or isotype control Ab. Specific MFI was determined for CD11b+/CD11c+ cells by flow cytometry (see Materials and Methods). (D) C57BL/6J DCs (105/well) were cultured for 24 h with medium, IFN-β, Pam3CSK4, or LPS, washed, and fixed with 1% paraformaldehyde. OVA(323–339) peptide and CD4OVA T hybridoma cells were added for 24 h. Supernatants were assessed for IL-2. (E) C57BL/10ScnJ DCs (105/well) were incubated for 24 h with OVA protein with or without IFN-β or Pam3CSK4 and fixed. CD4OVA T hybridoma cells were added for 24 h to detect MHC-II–peptide complexes, and supernatants were assessed for IL-2. Data represent the means of triplicate samples ± SDs and are representative of three or more independent experiments. Student t test was performed to compare results with medium and each other condition. *p < 0.05, **p < 0.01, ***p < 0.001, ****p < 0.0001. When DC maturation is induced by TLR signaling, MHC-II Ag processing is transiently boosted; but as maturation proceeds, MHC-II Ag processing is diminished, and efficient Ag presentation is focused on previously created peptide–MHC-II complexes. Thus, after 20 h of maturation induced by Pam3CSK4 or LPS prior to the addition of Ag, we observed substantial inhibition of MHC-II Ag processing activity by Flt3L DCs (Fig. 2A). In contrast, when DCs were incubated with IFN-β for 20 h prior to the addition of Ag, active MHC-II Ag processing was maintained (Fig. 2A). Similar results were observed with several concentrations of IFN-β (10–1000 U/ml), Pam3CSK4 (1–100 nM), and LPS (10–100 ng/ml) (data not shown). We conclude that IFN-I induces a distinct pattern of DC maturation that allows continued MHC-II Ag processing, in contrast to the inhibition of MHC-II Ag processing after DC maturation induced by TLR agonists. We confirmed these results in murine GM-CSF DCs and found that incubation with Pam3CSK4 and LPS inhibited subsequent MHC-II Ag processing (e.g., after 20 h), but MHC-II Ag processing was maintained after 20 h of incubation with IFN-β (Fig. 2B). MHC-II Ag processing was also maintained in Flt3L DCs after maturation with IFN-α (Fig. 2C). CpG-A ODN activates TLR9 and drives production of IFN-I, but this TLR agonist also inhibited MHC-II Ag processing (Fig. 2C). Furthermore, the addition of IFN-β did not prevent Pam3CSK4 from inhibiting MHC-II Ag processing (Fig. 2C), indicating that inhibition by TLR agonists is a dominant effect. DCs treated with TLR agonists expressed higher surface CD80, CD86, and MHC-II (Fig. 1), indicating that the inhibition is not due to toxicity and is specific for MHC-II Ag processing. In these studies, we found that MHC-II Ag processing was inhibited after maturation driven by IFN-inducing and non-IFN-inducing TLR agonists, but not after maturation induced by IFN-I alone. TLR agonists and IFN-I induce functionally different states of DC maturation with persistent MHC-II Ag processing only after IFN-I–induced maturation. (A) Flt3L DCs (105/well) or (B) GM-CSF DCs (105/well) were cultured for 20 h with medium, IFN-β (100 U/ml), Pam3CSK4 (10 nM), or LPS (50 ng/ml), washed, incubated with OVA for 4 h, and fixed. CD4OVA T hybridoma cells were added to detect MHC-II–peptide complexes, and supernatants were assessed for IL-2. Data represent the means of triplicate samples ± SDs in an experiment representative of three independent experiments. (C) Flt3L DCs (105/well) were cultured for 20 h with medium, IFN-α (100 U/ml), IFN-β (100 U/ml), Pam3CSK4 (10 nM), LPS (50 ng/ml), CpG-A ODN (300 nM), or IFN-β (100 U/ml) plus Pam3CSK4 (10 nM), washed, incubated with OVA (316 μg/ml) for 4 h, and fixed. CD4OVA T hybridoma cells were added to detect peptide–MHC-II complexes, and supernatants were assessed for IL-2. Data represent the means of triplicate samples ± SDs in an experiment representative of two or more independent experiments. Significance was determined by comparing treatment conditions with medium alone at the same Ag concentration using Student t test. *p < 0.05, **p < 0.01, ***p < 0.001, ****p < 0.0001. To expand the relevance of our findings, we confirmed these results in human DCs. In primary human mDCs from peripheral blood, incubation with IFN-α, IFN-β, and Pam3CSK4 induced CD86 (Fig. 3A), CCR7 (Fig. 3B), CD80 (data not shown), and HLA-DR (data not shown). Furthermore, human mDCs that were preincubated with Pam3CSK4 for 16–18 h prior to Ag exposure had decreased subsequent MHC-II Ag processing, but MHC-II Ag processing was maintained after 16–18 h of preincubation with IFN-α (Fig. 3C). The DCs were viable and responsive to stimulation, as indicated by upregulation of CCR7 induced by all of these agents (Fig. 3B). We conclude that IFN-I induces a distinct DC maturation program that maintains MHC-II Ag processing activity in multiple DC models, whereas maturation driven by a TLR agonist leads to inhibition of subsequent MHC-II Ag processing. IFN-I differs from a TLR2 agonist in its ability to induce human DC maturation without inhibiting MHC-II Ag processing. Human mDCs (2 × 104 to 5 × 104) were cultured for 16–18 h with medium, human IFN-α2a (300 U/ml), human IFN-β (300 U/ml), or Pam3CSK4 (10 nM) in the continued presence of GM-CSF (200 U/ml). DCs were stained with anti–HLA-DR and (A) anti-CD86 or (B) anti-CCR7. Gating was based on size and selection of HLA-DR–positive events. Data show the MFI of cells from one representative donor of three independently assessed donors. (C) Human mDCs (104) were treated with medium, IFN-α2a, or Pam3CSK4 for 16–18 h, washed, and incubated with Ag85B protein and F9A6 T hybridoma cells for 24 h, and supernatants were assessed for IL-2. Data represent the means of triplicate samples ± SDs from one of two independent experiments. Significance was determined by comparing results with IFN-α2a or Pam3CSK4 to the results with medium at the same concentration of Ag85B using Student t test. ***p < 0.001. Because IFN-I–induced DC maturation allowed continued MHC-II Ag processing activity, in contrast to DC maturation induced by TLR agonists, we hypothesized that DC maturation states induced by these two stimuli would differ in regulation of MHC-II synthesis. Incubation of DCs with Pam3CSK4, LPS, or CpG-A ODN strongly inhibited MHC-II mRNA (e.g., mRNA for the β-chain of I-Ab, I-Aβb), whereas IFN-β decreased MHC-II mRNA expression only slightly (Fig. 4A, 4B). The difference in inhibition of MHC-II mRNA was particularly striking at the 24 h time point (Fig. 4B), which corresponds kinetically with substantial progression to a mature DC phenotype. Addition of IFN-β did not prevent the inhibition of MHC-II mRNA by Pam3CSK4 (Fig. 4B), again indicating that the TLR-induced DC maturation response is dominant over the effects of IFN-I. Transcription of MHC-II mRNA is dependent on the transcription factor CIITA, which exists in three different isoforms (types I, III, and IV; expressed from a single gene with three promoters, pI, pIII, and pIV); type I is the dominant CIITA form in DCs (31). Our quantitative RT-PCR (qRT-PCR) analysis targeted a sequence common to all CIITA isoforms, yielding a measure of total CIITA expression. We found that TLR agonists Pam3CSK4, LPS, and CpG-A ODN inhibited DC expression of CIITA mRNA, whereas CIITA expression remained high after treatment with IFN-α or IFN-β (Fig. 4C). Treatment with IFN-β did not prevent CIITA mRNA inhibition by Pam3CSK4 (Fig. 4C). As a control, we found that all of these reagents induced higher expression of CD86 (data not shown), suggesting that the cells were viable and responsive to the different stimuli. We conclude that expression of CIITA and MHC-II is inhibited after TLR-induced DC maturation but not after IFN-I–induced DC maturation. Expression of mRNA for MHC-II and CIITA is inhibited by TLR agonists but not IFN-I. (A) Flt3L DCs (4 × 106/well) were cultured in a time course with IFN-β (200 U/ml) or Pam3CSK4 (10 nM). Total mRNA was prepared and analyzed by qRT-PCR with primers for MHC-II (I-Aβb). Data represent the means of triplicate samples ± SDs from one of three independent experiments. (B and C) Flt3L DCs (3 × 106 to 5 × 106/well) were cultured for 18–24 h with medium, IFN-α (100 U/ml), IFN-β (100 U/ml), Pam3CSK4 (10 nM), LPS (50 ng/ml), CpG-A ODN (300 nM), or IFN-β (100 U/ml) plus Pam3CSK4 (10 nM). Total mRNA was prepared and analyzed by qRT-PCR with primers for (B) MHC-II (I-Aβb) or (C) CIITA (sequence shared by types I, III, and IV CIITA). Data represent the means of two or more independent experiments per condition, as indicated, ±SDs. (D) Wild-type or MyD88−/− DCs (3 × 106 to 4 × 106/well) were cultured 24 h with medium, IFN-β (100 U/ml), Pam3CSK4 (10 nM), poly(I:C), LPS (50 ng/ml), or CpG-A ODN (300 nM). Total mRNA was prepared and analyzed by qRT-PCR with primers for MHC-II. Data represent the means of three independent experiments per condition ± SDs. Values for (A)–(D) were normalized for expression of GAPDH, and significance was determined by comparing results with treatment conditions and medium alone using Student t test. *p < 0.05, **p < 0.01, ***p < 0.001. (E) Nuclear fractions were prepared from DCs treated for 20 h with medium, IFN-β (100 U/ml), Pam3CSK4 (10 nM), or LPS (50 ng/ml) and analyzed by Western blotting (10 μg/ lane) for actin (top panel, loading control) and C/EBP-β (lower panel). Because TLR agonists exerted a dominant inhibitory effect on MHC-II mRNA expression, we tested the hypothesis that this inhibition is downstream of MyD88 signaling. Poly(I:C) activates MyD88-independent signaling through TLR3. Treatment with poly(I:C) resulted in downregulation of MHC-II, suggesting that the TRIF pathway can also mediate inhibition of MHC-II mRNA transcription (Fig. 4D). Furthermore, Pam3CSK4 and CpG-A ODN 2336 did not inhibit MHC-II synthesis in MyD88−/− DCs, whereas poly(I:C) did (Fig. 4D). Notably, LPS inhibition of MHC-II mRNA was largely reversed in MyD88−/− DCs, suggesting that LPS drives this inhibition primarily through MyD88 (Fig. 4D). We have previously demonstrated that IFN-γ–induced CIITA expression is inhibited by TLR2 agonists in macrophages because of the induction of C/EBP transcription factors (57). To explore whether a similar mechanism may be used during DC maturation, we treated DCs with agonists for 20 h, prepared nuclear extracts, and performed Western blots for C/EBP-β. LPS and Pam3CSK4 strongly induced the expression of both C/EBP-β isoforms, LAP and LIP, whereas IFN-β induced only low levels of C/EBP-β (Fig. 4E). Taken together, these results suggest that TLR signaling by the MyD88 and TRIF pathways in DCs induces C/EBP and thereby inhibits CIITA and MHC-II synthesis. In contrast, IFN-I induces only low levels of C/EBP-β, thereby allowing continued synthesis of CIITA and MHC-II. Maturation of DCs by TLR signaling involves decreased MHC-II synthesis and subsequent Ag processing, but IFN-I does not inhibit MHC-II synthesis and Ag processing (Figs. 2–4). We considered whether differences in the regulation of Ag processing function by IFN-I and TLRs might involve functions other than MHC-II synthesis; for example, endocytosis of Ag or MHC-II or effects on the stability of peptide–MHC-II complexes. We did not observe significant differences in Ag uptake or degradation after treatment of DCs with IFN-I or TLR agonists within the time frame and conditions of these experiments (data not shown), so we focused our attention on MHC-II endocytosis and stability. MHC-II targeting for degradation is driven in part by ubiquitination of MHC-II by MARCH1, an E3 ubiquitin ligase that is expressed in immature DCs and downregulated during DC maturation in response to TLR agonists such as LPS (20, 22, 23, 25). Because endogenous MARCH1 expression is difficult to detect by Western blotting with available Abs (21), we performed qRT-PCR for MARCH1 mRNA. Relative to immature DCs (incubated in normal medium), expression of MARCH1 mRNA was inhibited in DCs that were matured with IFN-β, LPS, or Pam3CSK4 for 24 h, although the degree of inhibition was less with IFN-β than with Pam3CSK4 or LPS (Fig. 5A). Coincident with the changes in MARCH1 expression, ubiquitination of MHC-II molecules was drastically reduced in DCs matured with IFN-β, Pam3CSK4, or LPS (Fig. 5B). Furthermore, MHC-II degradation products observed by Western blotting of total cell lysates were reduced for all matured cells versus immature DCs (data not shown). Stability and endocytosis of MHC-II molecules in IFN-β–treated DCs. (A) DCs (3 × 106 to 4 × 106/well) were cultured with medium, IFN-β (100 U/ml), Pam3CSK4 (10 nM), or LPS (50 ng/ml) for 24 h. Total mRNA was prepared and analyzed by qRT-PCR with primers for MARCH1. Data represent the means of three or more independent experiments ± SDs. Significance was determined for comparison of agonists to medium or TLR agonists to IFN-β using Student t test. *p < 0.05, ***p < 0.001. (B) DCs were treated with agonists for 24 h, cell extracts were prepared, and immunoprecipitations were performed using control (“C”) or anti-MHC class II (“Y3P”) Abs. Samples were analyzed by SDS-PAGE followed by immunoblotting with anti-ubiquitin (top panel, 8 × 106 cells per lane) or anti–MHC-II (KL295, bottom panel, 5 × 105 cells/lane). Data are representative of two independent experiments. (C) Flt3L DCs were cultured with medium, IFN-β (100 U/ml), Pam3CSK4 (10 nM), or LPS (50 ng/ml) for 24 h. DCs were pulsed with OVA(323–339) peptide for 4 h, washed, and chased for varying amounts of time prior to fixation. CD4OVA T hybridoma cells were added to detect peptide–MHC-II complexes, and supernatants were assessed for IL-2. Data represent the means of triplicate samples ± SDs in an experiment representative of two independent experiments. (D) MHC-II endocytosis was followed by the loss of Ab bound to surface MHC-II molecules. After 24 h treatment with medium, IFN-β (100 U/ml), or LPS (50 ng/ml), DCs were stained with unconjugated anti–MHC-II Ab, washed, and then returned to culture. Aliquots were removed at 0, 45, or 90 min, placed on ice, and stained with Alexa Fluor 488-conjugated secondary Ab. Duplicate samples were analyzed by flow cytometry, and the specific MFI was normalized to the 0-h time point. To evaluate the stability of peptide–MHC-II complexes expressed on the plasma membrane, DCs were treated with medium, IFN-β, LPS, or Pam3CSK4 for 24 h, pulsed with OVA(323–339) peptide, washed, and returned to culture for 0–31 h. Using CD4OVA T hybridoma cells and IL-2 production as a readout, we observed that peptide–MHC-II complexes were highly stable in DCs after maturation with LPS or Pam3CSK4 (apparent t1/2 >31 h), whereas these complexes declined rapidly in immature DCs or DCs matured with IFN-β (apparent t1/2 <7 h) (Fig. 5C). In parallel with the changes in stability of peptide–MHC-II complexes, MHC-II endocytosis was inhibited by LPS but not IFN-β (Fig. 5D), suggesting that some MHC-II endocytosis proceeds independent of MHC-II ubiquitination in DCs matured with IFN-I. Taken together, these data indicate that MARCH1 expression and MHC-II ubiquitination are decreased by all of these agonists, whereas endocytosis of MHC-II and the short half-life of peptide–MHC-II complexes are maintained after treatment with IFN-β, distinct from the effects of the TLR agonists. Although MARCH1 expression and MHC-II ubiquitination are associated with MHC-II turnover in immature DCs, they may not fully predict MHC-II stability and Ag presentation phenotypes in DCs matured by different stimuli. Overall, these results indicate that peptide–MHC-II complexes in IFN-I–matured DCs have a relatively short half-life, similar to that of immature DCs and distinct from the much longer half-life seen in TLR-matured DCs. During MHC-II Ag processing, MHC-II molecules are loaded with peptides in endocytic vacuolar compartments and then translocated to the cell surface for MHC-II Ag presentation. Immature DCs express MHC-II molecules in intracellular compartments, but MHC-II expression is shifted to the cell surface after DC maturation (28). Given the different MHC-II regulation seen during DC maturation driven by TLR stimulation versus that by IFN-I, we assessed whether these stimuli differ in regulation of MHC-II localization. Immature DCs (unstimulated, medium control) primarily expressed MHC-II in intracellular vacuoles, which appeared as punctate structures by fluorescence microscopy (Fig. 6A). After incubation with IFN-β (Fig. 6B, 6C) or IFN-α (data not shown), many DCs continued to express MHC-II in intracellular vacuoles, although more DCs expressed MHC-II at the cell surface, and some DCs expressed MHC-II simultaneously at the cell surface and in vacuolar structures (Fig. 6C). In contrast, incubation with Pam3CSK4 (Fig. 6D) or LPS (Fig. 6E) resulted in DCs that expressed MHC-II predominantly on the cell surface with few noticeable punctate structures. 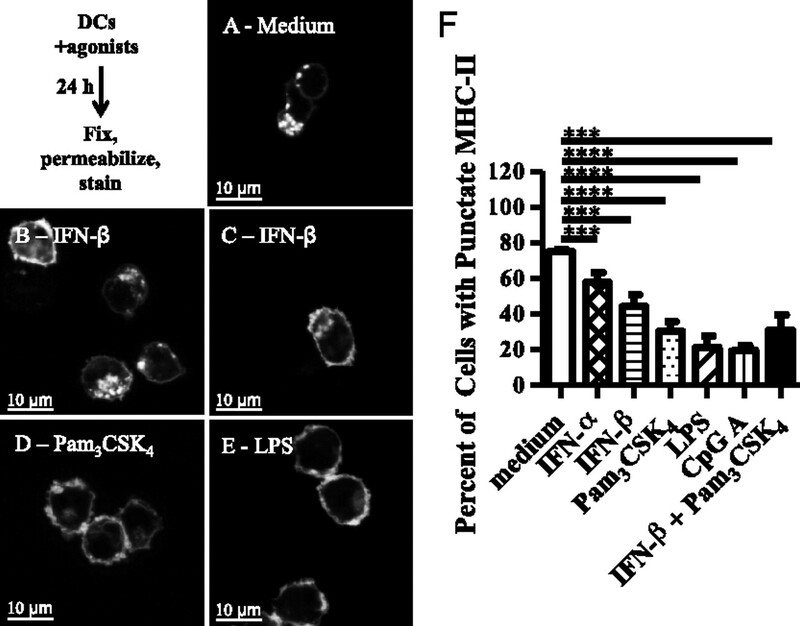 Quantification of the percentage of cells with punctate MHC-II staining showed that intracellular MHC-II localization was maintained more in DCs matured with IFN-I than in DCs matured with TLR agonists (Fig. 6F). IFN-I induces less translocation of MHC-II to the cell surface than TLR agonists. (A–E) Flt3L DCs (3 × 106 to 4 × 106) were cultured for 24 h with medium, IFN-α (100 U/ml), IFN-β (100 U/ml), Pam3CSK4 (10 nM), LPS (50 ng/ml), CpG-A ODN (300 nM), or IFN-β (100 U/ml) plus Pam3CSK4 (10 nM). DCs were washed, fixed, permeabilized, and labeled with anti–MHC-II. Images shown are representative of three or more independent experiments. (F) Quantification of the proportion of cells with punctate expression of MHC-II. Data represent the means of three or more independent experiments ± SDs. Treatment conditions were compared with medium alone to determine significance using Student t test. ***p < 0.001, ****p < 0.0001. 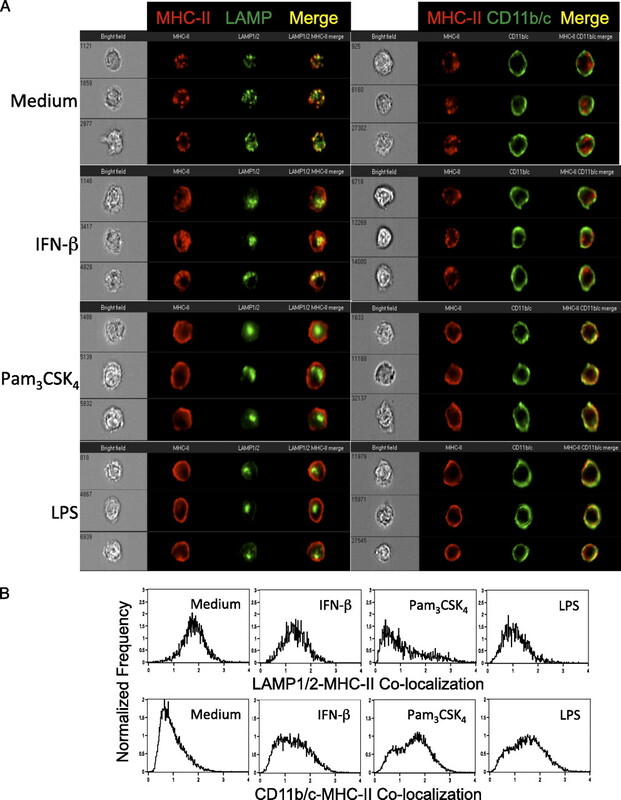 To characterize further the differences between populations of DCs after treatment with different stimuli, we used imaging flow cytometry quantitatively to determine colocalization of MHC-II with lysosomal markers LAMP1 and LAMP2 (LAMP1/2). Colocalization of MHC-II with LAMP1/2 was highest in untreated cells (Fig. 7), persisted at slightly lower levels in cells treated with IFN-β (Fig. 7) or IFN-α (data not shown), and was substantially decreased by Pam3CSK4 (Fig. 7), LPS (Fig. 7), or CpG-A ODN (data not shown). Notably, DC maturation driven by TLR agonists also resulted in a coalescence of LAMP1/2 staining (Fig. 7). These observations suggest that DCs induced to mature with TLR agonists no longer express MHC-II in the LAMP1/2-positive vacuolar MHC-II Ag processing compartments, whereas DCs treated with IFN-I continue to express MHC-II in these compartments, albeit at reduced levels in some cells. 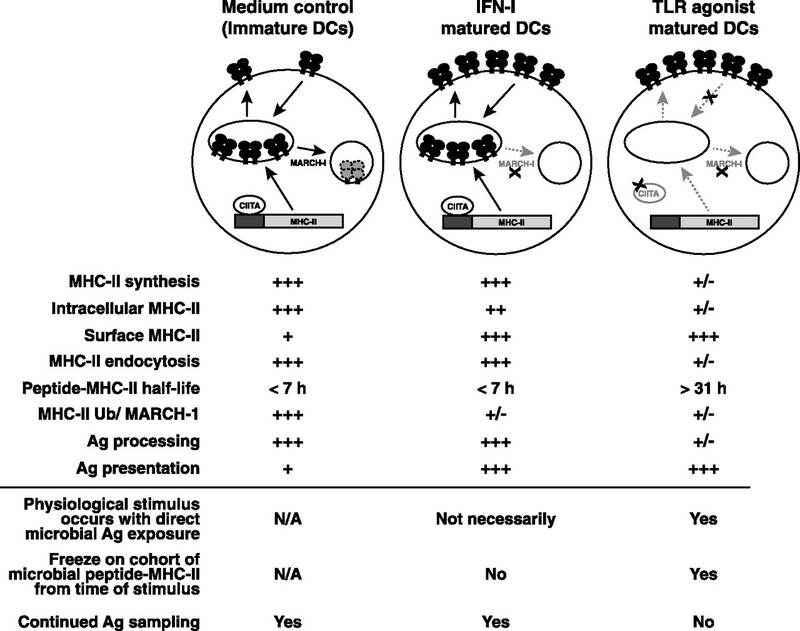 Intracellular MHC-II is decreased by TLR agonists more than IFN-β. DCs (3 × 106 to 4 × 106) were incubated for 22–24 h with medium, IFN-β (100 U/ml), Pam3CSK4 (10 nM), or LPS (50 ng/ml). Cells were surface-stained with anti-CD11b, fixed, permeabilized, labeled with anti–MHC-II and LAMP1/2, and analyzed with an Amnis Imagestream imaging flow cytometer at ×60 magnification. Gating was based on single cells that were in focus and expressed MHC-II and CD11b. (A) Left panels, Brightfield, MHC-II (red), LAMP1/2 (green), and merged MHC-II and LAMP1/2 images from the median colocalization bin. Right panels, Brightfield, MHC-II (red), CD11b/c (green), and merged MHC-II and CD11b/c images from the median colocalization bin. (B) Amnis IDEA software was used to calculate colocalization of MHC-II with LAMP1/2 or CD11b/c in cells with regions of bright detail for those markers. Upper panels, Distribution of colocalization scores in DC populations for MHC-II and LAMP1/2. Lower panels, Distribution of colocalization scores in DC populations for MHC-II and CD11b/c. Results represent one of four independent experiments with similar results. To determine the extent of translocation of MHC-II from the vacuole to the cell surface, we assessed MHC-II colocalization with DC surface markers CD11b and CD11c (CD11b/c). Colocalization of MHC-II with CD11b/c was lowest in untreated cells (Fig. 7), increased in cells treated with IFN-β (Fig. 7) or IFN-α (data not shown), and was highest in cells treated with Pam3CSK4 (Fig. 7), LPS (Fig. 7), or CpG-A ODN (data not shown). We conclude that DC maturation by IFN-I is characterized by 1) sustained MHC-II intracellular localization in the setting of continued MHC-II synthesis and endocytosis and 2) higher MHC-II surface levels in parallel with decreased degradation (Fig. 8). These unique features of MHC-II expression in IFN-I–matured DCs may allow for continued access of MHC-II to newly processed Ag in endocytic compartments in conjunction with high levels of cell surface MHC-II and Ag presentation function. IFN-I shares with TLR agonists the ability to initiate DC maturation as defined by enhanced expression of MHC-II, CD80, CD86, and enhanced Ag presentation function in T cell assays. In our studies, however, IFN-I and TLR agonists differed in their regulation of Ag processing function subsequent to maturation due to differences in MHC-II expression and localization in DCs. Expression of CIITA and MHC-II mRNA was maintained in IFN-I–matured DCs but not TLR-matured DCs. Similarly, MHC-II Ag processing function was maintained after stimulation with IFN-I but was inhibited 20 h after TLR stimulation. Intracellular MHC-II, required for active intracellular MHC-II Ag processing, was maintained after DC maturation in response to IFN-I but not after stimulation of DCs with TLR agonists. Fig. 8 summarizes the unique phenotype of IFN-I–matured DCs in comparison with those of immature DCs and TLR agonist-matured DCs. Together, these data establish that DC maturation by TLR agonists produces a subsequent shutdown of MHC-II Ag processing, whereas DC maturation induced by IFN-I allows continued MHC-II Ag processing function. Model for MHC-II synthesis, degradation, localization, and function for different DC maturation states induced by medium, IFN-I, or TLR agonists. Efficient Ag processing depends on MHC-II synthesis and MHC-II localization to endocytic Ag processing compartments, as is observed for immature and IFN-I–treated cells. Intracellular MHC-II in immature and IFN-I–matured DCs results from synthesis and internalization of MHC-II. Efficient Ag presentation is supported by high MHC-II expression at the cell surface, as is observed for IFN-I and TLR agonist matured cells. Because of decreased MARCH1 activity, cells treated with either IFN-I or TLR agonists exhibit reduced MHC-II degradation and increased surface expression. In the case of IFN-I–matured cells, we propose that the enhanced surface expression may be achieved in part by recycling of MHC-II molecules that, in the absence of MARCH1-mediated ubiquitination, are not sorted for degradation in lysosomes. Physiological interpretations are indicated below the horizontal line. In the absence of any stimuli, immature cells continue to sample Ag and rapidly turn over the peptide–MHC-II complexes that are expressed at the cell surface. In the case of TLR agonists, stimulation occurs at the time of direct exposure of DCs to microbes. Thus, microbial Ags will be processed at the time of the TLR stimulus, leading to a cohort of peptide–MHC-II complexes that are presented for a prolonged period after DC maturation, loss of Ag processing function, and MHC-II stabilization. In contrast, IFN-I induced DC maturation is not necessarily linked with microbial Ag encounter. Thus, continued Ag processing by IFN-I–matured DCs may enable them to continue to sample for microbial Ags to ensure presentation of these Ags, even if their sampling is not kinetically linked with the IFN-I stimulus. DC maturation is often considered an all-or-nothing program in which DCs are either immature or become mature, but these studies and others show that different stimuli result in different DC maturation states. One issue is whether some different stimuli induce differentiation toward qualitatively different phenotypes. Another issue is whether DC maturation must be all-or-nothing (the “binary model”) or whether some stimuli (e.g., IFN-I) may induce a partially mature phenotype that reflects incomplete progression along a standard maturation pathway. This partially mature phenotype may exhibit some but not all of the features induced by agents (e.g., TLR agonists) that drive more complete DC maturation. Even if maturation is all-or-nothing at the single-cell level, some stimuli may induce DC populations with an intermediate phenotype that are composed of a mixture of immature and fully mature cells. In contrast, our results suggest that, for some stimuli, maturation is a continuum rather than a binary state; for example, IFN-I provides a partial maturation signal for DCs that results in increased Ag processing and expression of MHC-II and costimulatory molecules without the subsequent shutdown that occurs with TLR stimulation. It appears that this reflects at least in part an intermediate state of maturation of some cells, as IFN-I induced DCs to express MHC-II simultaneously in vacuolar compartments and on the cell surface, distinct from both immature and TLR-matured phenotypes. Moreover, in dose-response studies, IFN-I failed to induce the full TLR-driven maturation phenotype even at high concentrations at which other IFN-I–induced changes (e.g., costimulator expression, MHC-II expression) were at plateau, further suggesting that IFN-I and TLR agonists drive qualitatively different states of DC maturation. Alternatively, this difference in maturation phenotypes may represent a kinetic difference in the induction of maturation of DCs; MyD88 signaling may rapidly drive maturation, resulting in downregulation of MHC-II Ag processing at early time points, whereas IFN-I induces maturation over a longer time course. Although some of these distinctions remain to be determined, we propose that IFN-I induces a state of partial maturation that is qualitatively distinct from the maturation state driven by TLR stimulation. Young and colleagues (22) demonstrated that pDCs and mDCs differ in the regulation of MHC-II after TLR9 stimulation. In some ways, the maturation response of mDCs to IFN-I stimulation (this study) is similar to the maturation response of pDCs to TLR9 stimulation (22). Unlike mDCs stimulated with TLR ligands, both mDCs treated with IFN-I and pDCs treated with CpG DNA express higher levels of MHC-II at the surface without a concomitant shutdown of MHC-II synthesis (Fig. 4 and Ref. 22) or MHC-II Ag processing (Fig. 3 and Ref. 22). In contrast to the observations with pDCs, however, we noted a more significant reduction in MARCH1 expression and MHC-II ubiquitination after maturation of mDCs with IFN-I (Fig. 5). Thus, there are both parallels and differences between these systems. The unique DC maturation state induced by IFN-I may be important in pathological situations that are driven primarily by IFN-I (e.g., certain viral infections) or where there is sequential exposure to IFN-I and then TLR agonists (Fig. 8). In the course of infection, some DCs may be exposed to IFN-I before they encounter PAMPs (e.g., TLR agonists) and Ags expressed by pathogens, and it may be important to avoid premature shutdown of Ag processing before DCs are exposed to pathogens. DCs generally encounter PAMPs at the time they encounter pathogen Ags, as both are contained within the pathogen, so PAMP signaling can be coordinated with production of a final cohort of peptide–MHC-II complexes that will provide presentation of pathogen Ags, followed by shutdown of Ag processing. In contrast, pathogen-induced IFN-I is a host-derived molecule that may reach and stimulate DCs that have not been exposed to pathogen Ags; if Ag processing shutdown were to occur in this scenario, it would focus Ag presentation on an antigenic repertoire missing pathogen-derived Ags, indicating the need for broader kinetic sampling relative to the time of IFN-I exposure. Accordingly, our results demonstrate that IFN-I initiates DC maturation without inhibiting Ag processing, allowing DCs to both increase MHC-II expression and continue to process Ags at sites of infection. The MyD88-driven maturation pathway is dominant over the IFN-I–induced maturation program, as we observed that simultaneous signaling by IFN-I and a MyD88-dependent TLR agonist drives shutdown of MHC-II Ag processing. Thus, if DC maturation is initiated by exposure to IFN-I, subsequent exposure to PAMPs may drive further maturation to produce a final cohort of pathogen-associated peptide–MHC-II complexes, followed by shutdown of Ag processing, focusing presentation on Ags encountered near the time of TLR stimulation. We thank Leola Jones for technical assistance. Paul Roche kindly provided protocols and advice. J558L cells were a kind gift from Ira Mellman (Genentech), courtesy of David Gray (University of Edinburgh). ↵1 D.P.S. and P.A.W. are joint first authors. This work was supported by National Institutes of Health Grants AI034343, AI035726, and AI069085 (to C.V.H. ), AI027243 and HL055967 (to W.H.B. ), and AI073217 and AI077056 (to D.H.C. ); the Case Comprehensive Cancer Center (P30 CA43703); and the Case Western Reserve University Center for AIDS Research (National Institutes of Health Grant AI036219). D.P.S. received partial support from National Institutes of Health Grants HL083823 and GM007250.
. 1999. Maturation, activation, and protection of dendritic cells induced by double-stranded RNA. J. Exp. Med. 189: 821–829.
. 2001. Regulation of T cell immunity by dendritic cells. Cell 106: 263–266.
. 2000. CpG DNA induces maturation of dendritic cells with distinct effects on nascent and recycling MHC-II antigen-processing mechanisms. J. Immunol. 165: 6889–6895.
. 2001. Microbial lipopeptides stimulate dendritic cell maturation via Toll-like receptor 2. J. Immunol. 166: 2444–2450.
. 1998. Bacterial DNA and immunostimulatory CpG oligonucleotides trigger maturation and activation of murine dendritic cells. Eur. J. Immunol. 28: 2045–2054.
. 1999. CpG DNA: a potent signal for growth, activation, and maturation of human dendritic cells. Proc. Natl. Acad. Sci. USA 96: 9305–9310.
. 1996. Regulation of dendritic cell numbers and maturation by lipopolysaccharide in vivo. J. Exp. Med. 184: 1413–1424.
. 1998. Dendritic cell survival and maturation are regulated by different signaling pathways. J. Exp. Med. 188: 2175–2180.
. 1993. Dendritic cell progenitors phagocytose particulates, including bacillus Calmette-Guerin organisms, and sensitize mice to mycobacterial antigens in vivo. J. Exp. Med. 178: 479–488.
. 1994. The tissue distribution of the B7-2 costimulator in mice: abundant expression on dendritic cells in situ and during maturation in vitro. J. Exp. Med. 180: 1849–1860.
. 1992. Functional expression of the costimulatory molecule, B7/BB1, on murine dendritic cell populations. J. Exp. Med. 176: 1215–1220.
. 2010. TLR signalling regulated antigen presentation in dendritic cells. Curr. Opin. Immunol. 22: 124–130.
. 2001. MHC class II expression is regulated in dendritic cells independently of invariant chain degradation. Immunity 14: 739–749.
. 2004. Dendritic cells constitutively present self antigens in their immature state in vivo and regulate antigen presentation by controlling the rates of MHC class II synthesis and endocytosis. Blood 103: 2187–2195.
. 2011. CD83 increases MHC II and CD86 on dendritic cells by opposing IL-10-driven MARCH1-mediated ubiquitination and degradation. J. Exp. Med. 208: 149–165.
. 2009. Cutting edge: requirement of MARCH-I-mediated MHC II ubiquitination for the maintenance of conventional dendritic cells. J. Immunol. 183: 6893–6897.
. 2009. Discrete domains of MARCH1 mediate its localization, functional interactions, and posttranscriptional control of expression. J. Immunol. 183: 6500–6512.
. 2008. MHC class II stabilization at the surface of human dendritic cells is the result of maturation-dependent MARCH I down-regulation. Proc. Natl. Acad. Sci. USA 105: 3491–3496.
. 2010. Ubiquitination regulates MHC class II-peptide complex retention and degradation in dendritic cells. Proc. Natl. Acad. Sci. USA 107: 20465–20470.
. 1995. Dendritic cells use macropinocytosis and the mannose receptor to concentrate macromolecules in the major histocompatibility complex class II compartment: downregulation by cytokines and bacterial products. J. Exp. Med. 182: 389–400.
. 1990. Disappearance of certain acidic organelles (endosomes and Langerhans cell granules) accompanies loss of antigen processing capacity upon culture of epidermal Langerhans cells. J. Exp. Med. 172: 1471–1482.
. 2001. Maturation of dendritic cells is accompanied by rapid transcriptional silencing of class II transactivator (CIITA) expression. J. Exp. Med. 194: 379–391.
. 2002. Regulation of class II MHC expression in APCs: roles of types I, III, and IV class II transactivator. J. Immunol. 169: 1326–1333.
. 2002. IFN-alpha enhances CD40 ligand-mediated activation of immature monocyte-derived dendritic cells. Int. Immunol. 14: 367–380.
. 1998. Interferon-alpha and granulocyte-macrophage colony-stimulating factor differentiate peripheral blood monocytes into potent antigen-presenting cells. J. Leukoc. Biol. 64: 358–367.
. 1999. Low levels of interferon-alpha induce CD86 (B7.2) expression and accelerates dendritic cell maturation from human peripheral blood mononuclear cells. Scand. J. Immunol. 50: 499–509.
. 1999. Natural adjuvants: endogenous activators of dendritic cells. Nat. Med. 5: 1249–1255.
. 2002. The natural alliance between type I interferon and dendritic cells and its role in linking innate and adaptive immunity. J. Interferon Cytokine Res. 22: 1071–1080.
. 2005. Dendritic cell maturation, but not CD8+ T cell induction, is dependent on type I IFN signaling during vaccination with adenovirus vectors. J. Immunol. 175: 6032–6041.
. 2003. Timing of IFN-beta exposure during human dendritic cell maturation and naive Th cell stimulation has contrasting effects on Th1 subset generation: a role for IFN-beta-mediated regulation of IL-12 family cytokines and IL-18 in naive Th cell differentiation. J. Immunol. 171: 5233–5243.
. 2008. MyD88 and IFN-alphabeta differentially control maturation of bystander but not Salmonella-associated dendritic cells or CD11cintCD11b+ cells during infection. Cell. Microbiol. 10: 1517–1529.
. 2003. 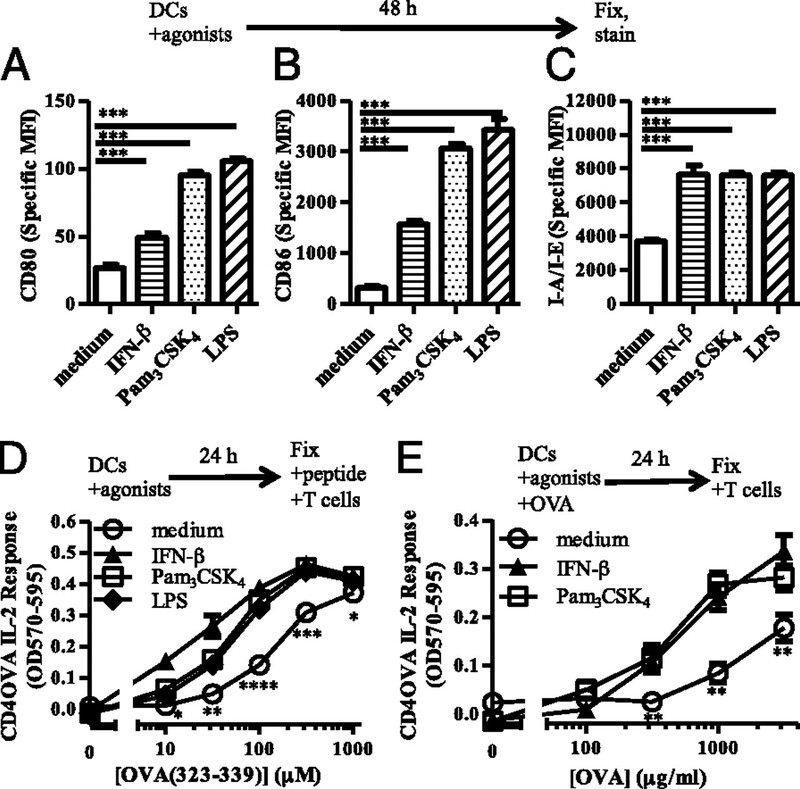 Selective contribution of IFN-alpha/beta signaling to the maturation of dendritic cells induced by double-stranded RNA or viral infection. Proc. Natl. Acad. Sci. USA 100: 10872–10877.
. 2005. Enhancement of dendritic cell antigen cross-presentation by CpG DNA involves type I IFN and stabilization of class I MHC mRNA. J. Immunol. 175: 2244–2251.
. 2001. Type I interferon is required to mount an adaptive response to immunostimulatory DNA. Eur. J. Immunol. 31: 3281–3290.
. 2002. IFN-alpha beta promote priming of antigen-specific CD8+ and CD4+ T lymphocytes by immunostimulatory DNA-based vaccines. J. Immunol. 168: 4907–4913.
. 2009. IFN-alpha enhances peptide vaccine-induced CD8+ T cell numbers, effector function, and antitumor activity. J. Immunol. 182: 7398–7407.
. 2010. Mycobacterium tuberculosis and TLR2 agonists inhibit induction of type I IFN and class I MHC antigen cross processing by TLR9. J. Immunol. 185: 2405–2415.
. 2006. Class II MHC antigen presentation defect in neonatal monocytes is not correlated with decreased MHC-II expression. Cell. Immunol. 243: 96–106.
. 2010. Mycobacterium tuberculosis promotes HIV trans-infection and suppresses major histocompatibility complex class II antigen processing by dendritic cells. J. Virol. 84: 8549–8560.
. 2003. T-cell hybridomas from HLA-transgenic mice as tools for analysis of human antigen processing. J. Immunol. Methods 281: 129–142.
. 2000. Enhanced production of recombinant Mycobacterium tuberculosis antigens in Escherichia coli by replacement of low-usage codons. Infect. Immun. 68: 233–238.
. 2010. Presenting exogenous antigen to T cells. Curr. Protoc. Immunol. Chapter 16: Unit 16.2.
. 2010. CpG-B oligodeoxynucleotides inhibit TLR-dependent and -independent induction of type I IFN in dendritic cells. J. Immunol. 184: 3367–3376.
. 1984. Monoclonal antibodies specific for Ia glycoproteins raised by immunization with activated T cells: possible role of T cellbound Ia antigens as targets of immunoregulatory T cells. J. Immunol. 132: 662–667.
. 2007. CCAAT/enhancer-binding protein beta and delta binding to CIITA promoters is associated with the inhibition of CIITA expression in response to Mycobacterium tuberculosis 19-kDa lipoprotein. J. Immunol. 179: 6910–6918.